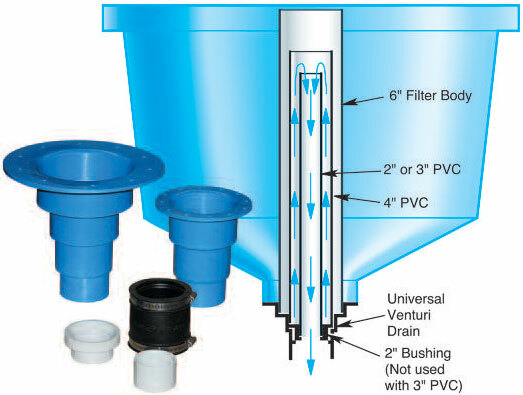 The Venturi Kit consists of our exclusively-designed drain, a 3"x2" bushing, a stop collar for the center pipe, and a rubber boot w/clamps to attach the drain pipe. All other components may be purchased from any hardware supplier. The drain may be used with a 2" inside center stand pipe with 4" pipe around it; or a 3" inside center stand pipe with 4" pipe around it for maximum lift. The 6" screen body can be easily changed as fish grow. Universal fitting for many round tanks. Bolts on to the outside bottom of the tank for unobstructed drainage. 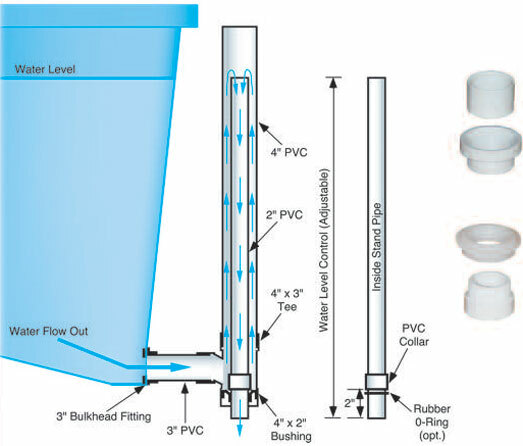 The Outside Drain Kit consists of a PVC T, a custom-made reducing bushing, a stop collar, and a bulkhead fitting. All other components may be purchased from any hardware supplier. Two sizes available: 4"x3" and 3"x2"
Water level adjusts from outside of tank. This outside the tank set-up performs very well where no obstruction is wanted inside the tank. Bulkhead sizes available: 1", 1.5", 2", 3", 4"